It only takes a small deal to strike a large hike in share values, it seems. 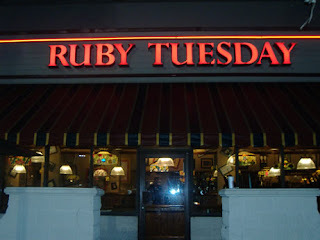 According to The Street, shares in Ruby Tuesday restaurants (Maryville, Tennessee) soared 22.5% apiece to $2.40 on news that a new franchise agreement had been concluded with Global Brands Qatar for the opening and management of just three franchised outlets in Qatar over the coming five years. The franchise had nearly 700 outlets by 2007 (current figure not known). How much of the sudden leap in share price can be attributed to extra revenue, and how much to the higher brand profile once RT is trading in Doha?